1.5. Medical Devices—a Conservative World? 2.6. China—The Future Major Regulator? 2.7. Medical Device Industry Goes Pharma? 4. Generative Manufacturing Technologies—The Future? 6.4. Thermoplastic Elastomer the Better Elastomer? Emerging Trends in Medical Plastic Engineering and Manufacturing gives engineers and materials scientists working in the field detailed insights into upcoming technologies in medical polymers. While plastic manufacturing combines the possibility of mass production and wide design variability, there are still opportunities within the plastic engineering field which have not been fully adopted in the medical industry. In addition, there are numerous additional challenges related to the development of products for this industry, such as ensuring tolerance to disinfection, biocompatibility, selecting compliant additives for processing, and more. 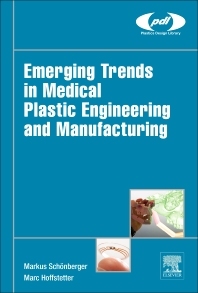 This book enables product designers, polymer processing engineers, and manufacturing engineers to take advantage of the numerous upcoming developments in medical plastics, such as autoregulated volume-correction to achieve zero defect production or the development of ‘intelligent’ single use plastic products, and methods for sterile manufacturing which reduce the need for subsequent sterilization processes. Finally, as medical devices get smaller, the book discusses the challenges posed by miniaturization for injection molders, how to respond to these challenges, and the rapidly advancing prototyping technologies. Polymer processing and manufacturing engineers. Biomedical engineers. Medical device consultants, process development scientists, design engineers, application engineers. Markus Schönberger is a Research Associate in the Institute of Medical and Polymer Engineering, Technische Universität München, specialising in sterile production in injecton molding, plastics analysis and testing, wear studies, degradation, and aging. Dr. Marc Hoffstetter is the Manager of Medical Devices at Scholz-HTIK, and is responsible for business unit development including medical engineering, pharmaceuticals, food and cosmetics. He was formerly a research fellow at Technische Universität München in the Institute of Medical and Polymer Engineering.